Comments: The vile villains have taken over. Batman is a prisoner but he does not give up hope. He has Robin, Batgirl and the Archie gang to rescue him. Archie’s car made up like the Batmobile is a site. Also seeing the gang spring into action against the forces of evil is a site as they do what’s right. This story unfolds just like the old Batman TV series. The art matches the characters t=from that show as well. Batman looks just how Adam West portrayed him. Twenty-two pages of comic and fourteen pages of ads. That is a lot of pages for advertising. Overall this is a fun comic that anyone who enjoyed the sixties TV show will enjoy also. There is violence and fighting yet it is all toned down for a general audience. 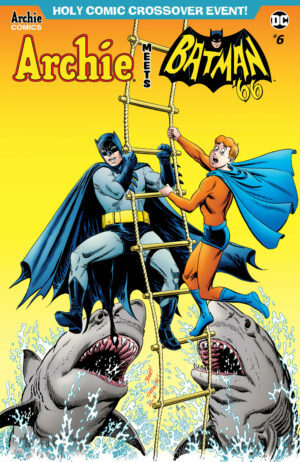 Batman’s character is a great homage to the late great Adam West.